The overall health of Palma Sola Bay continued to be very good in 2015. While the mean values for both nitrogen and phosphorus concentration rose slightly from 2014, the mean value for chlorophyll a concentration decreased. Water Quality: Palma Sola Bay retained its “Pass” rating as all three water quality indicators (chlorophyll a, nitrogen, and phosphorus) were below established thresholds. The mean concentration for chlorophyll a decreased significantly, to 0.0039 mg/l, despite slight increases in nutrients. Mean nitrogen concentration increased to 0.601 mg/l, still below the target of 0.74 mg/l. The mean concentration for phosphorus increased to 0.142 mg/l, exceeding the target value of 0.130 mg/l; as a result, the rating for phosphorus was downgraded from “Excellent” to “Good”. The ratings for nitrogen and chlorophyll a remained “Excellent”, as in 2014. The mean for chlorophyll a was calculated as an arithmetic mean and the means for nitrogen and phosphorus were calculated as geometric means (per the Numeric Nutrient Criteria outlined in the Florida Administrative Code, section 62-302.532). Biotic Indicator: Measurement of the biotic indicator, seagrass, was performed in 2014 by the Southwest Florida Water Management District. 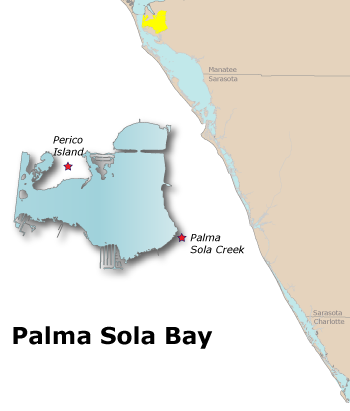 The total area of seagrass in Palm Sola Bay was estimated to be 1,548 acres, one and a half times the above the target acreage of 1,031 acres. Note: Light attenuation data collection began in 2012, prior years are not available.